What’s next in the vineyard? My notes from tasting through our vines on Monday. In a nutshell, close, but not quite there yet. 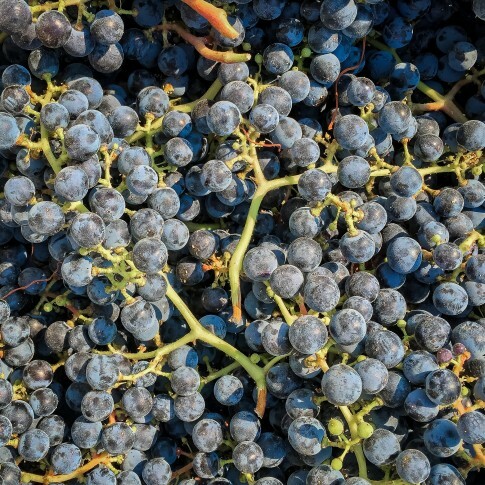 Cabernet Sauvignon: on Monday, most of the Cabernet Sauvignon clusters tasted beautiful. The problem is that a good percentage of them did not. Really odd range of variation. So we’re going to let the Cab hang a bit more to bring those problem clusters closer to loveliness, but not so far that the good stuff goes too far. Maybe early next week? Sangiovese: some wineries are already picking this, and I can see how you’d make an elegant wine out of it. But I want a little more depth — not too much, by any stretch — so I decided to let those hang as well. Maybe an additional week, too. Grenache: so very close. As I mentioned earlier, super odd that the juice tastes great but the skins are way behind. But those should be ready to go in a week, too, if not sooner. Viognier: not there yet; maybe mid next week? Mourvedre: definitely not there. Maybe 14 days out. In a nutshell, this is definitely ripe fruit! Now, Washington fruit always gives us numbers like this — high sugar, low pH — and we’ve rehydrated accordingly, to excellent results. But that said, I have to say these numbers are higher than I’d have thought after tasting them in the vineyard. But that’s okay. First, the fruit tastes damn good. The flavors are mature and in balance — they taste right — and to me, that takes precedence over the numbers. Not to their exclusion, for sure, but definitely not picking solely by them. Especially because, second, we can adjust those numbers downstream. And we definitely will: left as they are, the Syrah would be about 15% alcohol, and the Franc 16.5% – way too much alcohol for anyone but teenage boys. So we’ll be adding a few Jesus units (turning water into wine) to bring both down below 14%, and I’ll also be adding acid to bring that pH down into microbially safe territory. Syrah and Cabernet Franc are in the house! Today we brought in Syrah and Cabernet Franc – both tasted great in the vineyard. We also brought back a little bit of Viognier (in advance of our actual pick later this month) to co-ferment with the Syrah, as they do in Southern France. We did that in 2013, and it transformed what had been in previous vintages a kind of one-note wine into the best Syrah we’ve ever made. Here’s hoping the magic happens twice! Just got new brix, pH and TA numbers from the vineyard, so after a quick call to the vineyard manager, it seems the Franc is almost certainly ready, the Cab Sauv is almost certainly ready, and the Grenache probably in the window. So we may have 3 delicious grapes coming at us Monday or Tuesday..! After looking incredulously at the numbers from the vineyard, we headed east for our first pick today – Tempranillo and Merlot. Yeah, that’s 3 weeks early — wow. It’s a sign spring is here: not the chirping of birds, or the gentle unfolding of delicate flowers, but the popping of bungs. 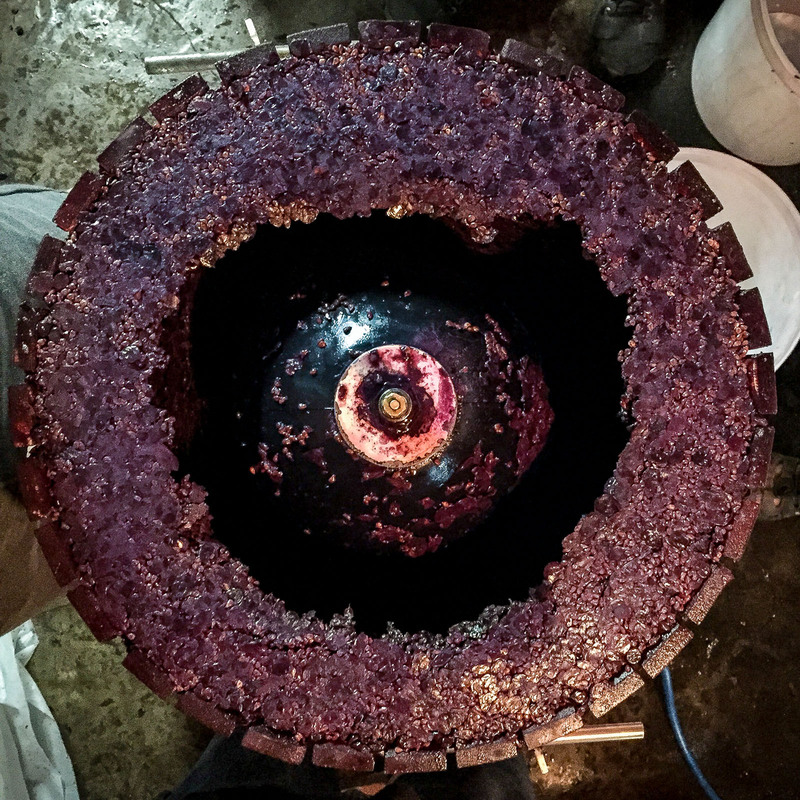 As the weather warms, wine expands and the pressure in the head space between wine and bung grows, ultimately popping out the bung you’ve carefully seated. If you’re lucky, sometimes you hear it pop, and respond quickly enough to see the bung still bouncing around the floor of the winery. A little air exposure isn’t the end of the world, even if you don’t catch it immediately, but the danger is if you miss it for a day or so. And then, less seriously, have to hunt the popped bung down – they’re surprisingly agile and can cover a lot of ground. 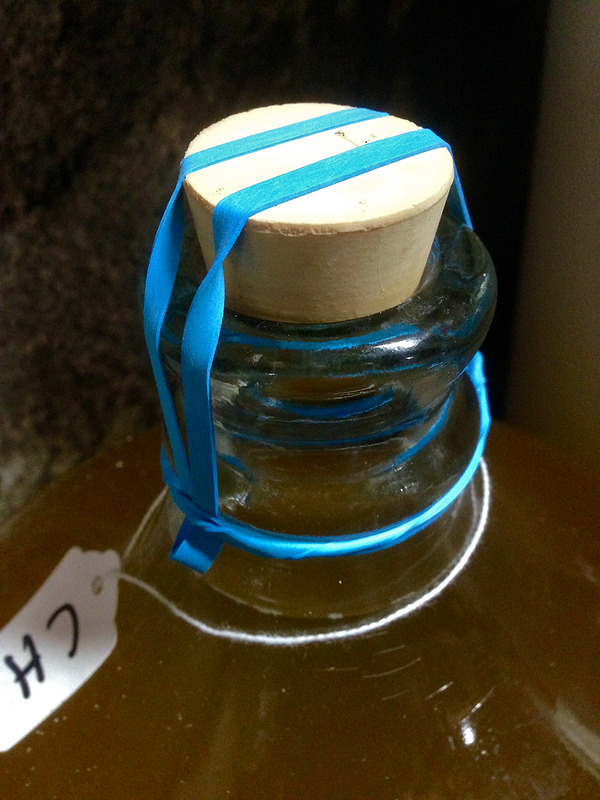 So this year, we’re trying something minimize that problem: improvised bung tie-downs.